Spring Clinics/Camps Registration is NOW Open!! The Hurricanes faced off against Team South Dakota in the final game Monday at Compton Family Ice Arena. South Dakota won all of its games during pool play, outscoring opponents 23-8 as they cruised to a spot in the finals. The Hurricanes, meanwhile, earned their spot in the finals based off of strong defensive play. While they didn’t have the same type of blowout wins that South Dakota had, three of their five games leading up to the finals were one-goal affairs. Carolina head coach David Wright agreed that defense has been a priority for the team. While scoring chances were plentiful in the first period — each team registered 13 shots on goal during the opening frame — goalies Kade Brecher (South Dakota) and Owen Techet (Carolina) both stood tall while their respective teams found their footing. 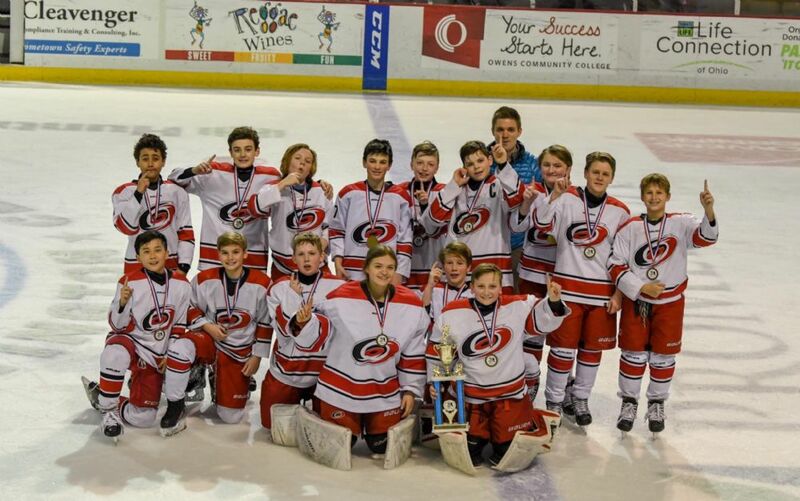 The Jr. Hurricanes shut down the 2A tournament’s leading goalscorer in Trent Anfinson and its assists leader in Will McDonnel Carolina scored once, midway through the second period, with a goal from forward Brayden Strong, but as the game progressed, scoring chances for each team slowed down. While some of that may have been due to each team settling into game play, it could also be due to the extensive special teams play in the latter portion of the game. The third period saw South Dakota with five infractions and Carolina with three, including a double minor for roughing. Tensions ran high for each team, and Wright was tasked with keeping his players focused in the face of a frustrated South Dakota squad. Carolina forward Ethan Joshi added a second goal for his team at 4:17 in the third period, and forward Emil Strandberg scored on the empty net to put the game essentially out of reach for South Dakota. Goalie Techet ended pool play with a save percentage of .905, ranking him eighth among all goaltenders — Brecher was No. 1 at .969 — but Wright didn’t hesitate to put him in net for Carolina’s biggest game of the tournament. Wright has leaned on Techet, who has played for the Hurricanes for two years, for big games. 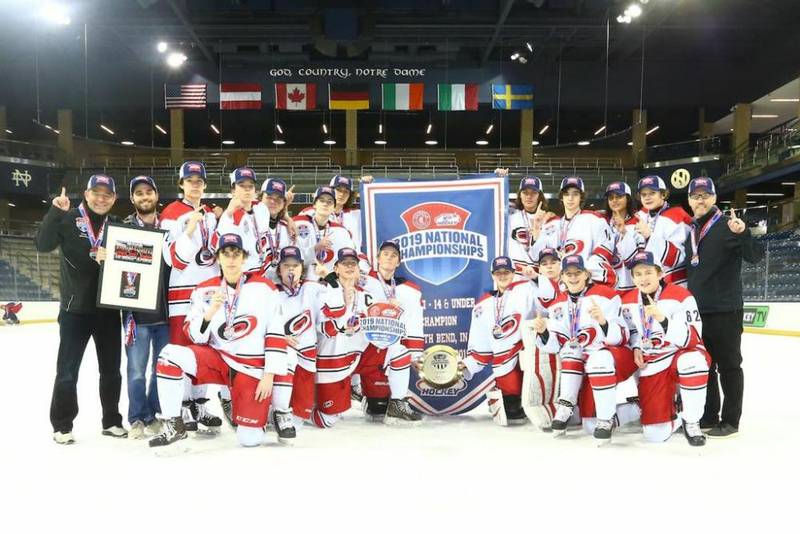 The Hurricanes were appearing in their second national championship tournament. As Wright told his team before Monday’s game, their performance wasn’t just a reflection on them, but on the Jr. Hurricanes organization as a whole and on the state of North Carolina. 14U AA Jr Canes - NATIONALS CHAMPIONS!!!!!!!!!! We were honored to have so many of you attend our program meeting on Sunday March 31st. We hope you found the meeting informative and insightful. Please click here to view the Power Point. Please click here to view the Video Presentation. The 2006 AAA Jr Hurricanes stormed into Toledo, Ohio and won the Ohio Valley Championship, besting the 10 teams in attendance. Round Robin play started with a 5-3 win over the Penguins Elite Black where balanced scoring helped seal the victory. The 2nd game was a back and forth battle with the Pittsburgh Predators. The Hurricanes needed a lot of goals in this one and a hat trick by Aidan Bearman led to a 6-5 win for the team from the South. Up next was the Columbus Lumberjacks. It was another close game and the Jr Hurricanes went down 3-1 by the end of the 1st. Their was no quit in this team and Cam Stehle had a hat trick of his own which helped overcome the deficit and lead to a 5-4 win. A 6-3 loss to the Indy Fuel rounded out round robin play but the team battled hard and earned the 3rd seed in the semifinal where they faced the South Hills Panthers. This one was tied at the end of regulation 4-4. In overtime, the Jr. Canes had to kill 4 minutes of penalties to force the shootout. With great goaltending by Mikayla “Boom” Williams and shootout goals by Kevin Ma and Casey Landrum, the Jr. Canes took this one in 8 rounds and headed to the finals against the hometown Sylvania North Stars. This was a grinding game where both teams left it all on the ice. In the end, the lone goal was scored by Cam Stehle and goalie Jack Foy stopped every shot he faced to earn the 1-0 shutout Championship victory. It was a great way to end the season…congratulations to the players and coaches for the hard earned Gold medal. 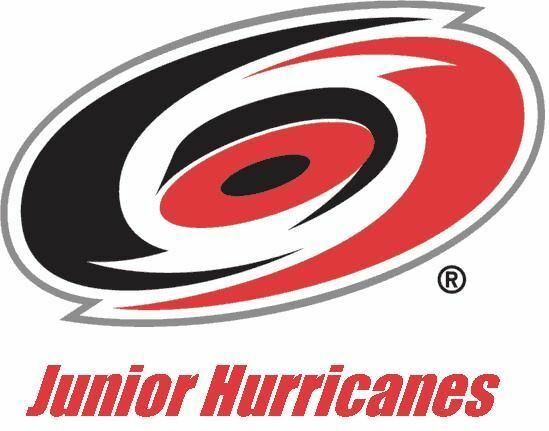 Registration is now open for the 2019 Carolina Junior Hurricanes Spring camps/clinics. These clinics are perfect for your player to stay in shape, sharpen his/her skills and get him/her ready for tryouts. A skills based camp designed to teach kids how to use good proper checking technique, and to compete in small areas using body position using both on ice and off ice techniques. 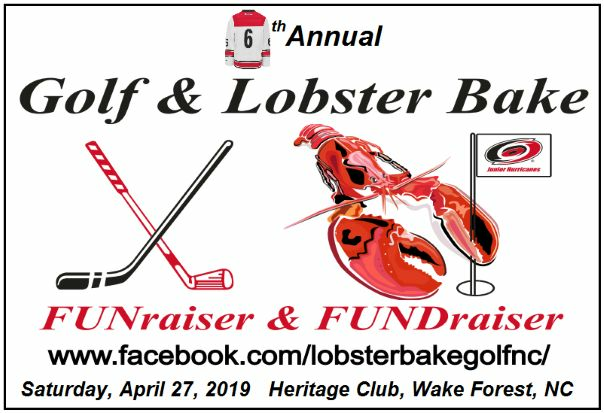 Get your foursomes ready for the 6th Annual Golf & Lobster Bake. This is a great day of golf and Maine lobster to finish off the night.